Corporate farm-sharing allows for this offering to be integrated into the workplace, which presents a new dimension of convenience for healthy eating amongst office employees. Fresh vegetables and other nutrient dense foods are delivered directly to the office, allowing employees complete accessibility to nutritious foods and ultimately, a healthier diet. Since the healthy foods can be consumed in the office or taken home, the program can deliver healthier diets outside of the workplace. A workplace farm-share program can be funded in multiple ways. An employer can fund the locally-sourced, healthy foods for all employees, subsidize part of the program so employees can buy in a at discount, or negotiate a favorable rate (similar to a traditional corporate discount program) that employees pay for themselves. All options are beneficial; they just vary in impact and cost. Because of the countless potential benefits of integrating farm-sharing into corporate wellness programs, below a list of farms in Massachusetts that provide this service to offices. The list will continually be updated to include local farm-shares across the country, so it can be a resource for all employers in the United States. Gentle Giant has been practicing organic farming techniques since 2012. Their primary goal is to provide accessible, local, fresh, quality produce that is grown with minimal impact. Beyond the confines of the farm, they also strive to foster meaningful connections between consumers, their food, and the hands that grow it. Their belief is that healthy eating, sustainable farming practices, and strong community bonds will result in positive changes to the food systems. Pricing: $17.50, $25.00, and $32.50 per week per small, medium, and large box, respectively. All share are 100% customizable and you can easily add on items or pause for vacations. Upper Pond Farm believes that everybody should have access to healthy food grown without harmful chemicals. Their mission is to provide delicious, fresh produce to the local community. They produce food using ecologically and financially sustainable methods while paying a socially just wage to workers. They will introduce members to new varieties of high quality produce, while providing them with the support to cook and enjoy them. Delivers: Within half an hour radius of the farm. Minimum of 10 shares per drop-off site. $5 per week delivery fee. Pricing: Summer shares are $500 and $800 for 20-week medium and large shares, respectively. Fall shares are $275 and $400 9-week shares. 5% discount for corporate clients. Bumbleroot Organic Farm is a certified organic farm located in Windham, Maine, just 10 miles from downtown Portland. They seek to build community and sustainable food systems and connect people with the land and food that sustains them. Their CSA Program provides weekly vegetables to local families for 20 weeks from June through October. They also attend local farmers' markets and sell their produce to local markets and restaurants. Darthia Farm is a partnership between Bill and Cynthia Thayer as well as Liz Moran and Shepsi Eaton with their two kids Harbor and Cedar. They enlist the help of their three draft horses and various short-term interns. 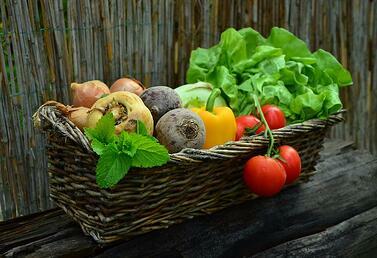 Their CSA program offers the traditional weekly pick up as well as a store membership option. In addition, members of the community can be a part of the program simply by sponsoring a local family in need of a membership. Darthia Farm also raises their own wool for spinning into yarn right on the farm! Pricing: $520 and $340 for 20-week family and single shares, respectively. Flower shares are $160, and Farm Store Memberships are from $300 and up. Sponsor a family in need by donating as little as $20! The multi-farm shares come from a cooperative of small Maine farms. By working together, they provide a wide variety of farm products, such as organic veggies, organic meat, bread, eggs, yogurt, and more! They offer flexible schedules, pay-as-you-go online ordering, and the ability to put shares on hold or change them at any time during the year. Fresh, chemical-free produce grown by refugee and immigrant producers in Cultivating Community’s New American Sustainable Agriculture Project. All fruits and vegetables are tended in nutrient-rich soil at their three farms in Lisbon, Falmouth, and South Portland. A rich diversity of vegetables including traditional Maine crops with some additional crops from around the world. Join Fresh Start Farms’ community of customers and, if you wish, come out to their farms’ next growing season! Pricing: $400 and $300 for 16-weeks standard and small shares, respectively. Staples shares to supplement store-bought vegetables are $200. $80 and $48 for weekly dozen and half dozen egg shares, respectively. Option to opt in for 8-week summer/autumn shares instead of full season for half price available. Frith Farm is an organic farm on 14 acres in Scarborough, Maine. Their mission is to build soil, increase biodiversity, and strengthen community by growing wholesome food. 2019 will be their ninth season in operation, offering organic vegetables and pasture raised eggs, chicken, pork, and turkeys. Pricing: $630 and $420 for full and half vegetable shares, respectively. Add-on pastured eggs or turkeys shares available. Nezinscot Farm began as the first organic dairy in the state of Maine. Through the desire to diversify and the passion for good food, Nezinscot’s owners, Gregg and Gloria Varney, expanded Nezinscot Farm to encompass a gourmet food shop, cafe, bakery, fromagerie, charcuterie, and a yarn and fiber studio. Pricing: $400 (+$15 bonus), $700 (+$30 bonus), and $1,000 (+$55 bonus) for quarter, half, and full shares, respectively. Investment shares are $3,000. Corporate share available based on size. Check out their website for more info! Sheepscot General is a one-of-a-kind country store situated on a working farm in beautiful Whitefield, Maine. They grow a diversity of MOFGA certified organic produce and strawberries. They also make maple syrup and manage an apple orchard. The owners, Ben and Taryn Marcus, revitalized a famously fertile piece of land and transformed the store into a thriving community food hub, a story that was made into a short documentary that is worth checking out. Pricing: Sheepscot is a credit-style CSA. Members pay up-front and receive a 10% return on investment (e.g., a $100 payment = $110 credit). They can then use the credit to shop anything at the farm. Spriritwind Farm provides organically grown seasonal produce. Their main focus is on gourmet salad mixes and micro greens that are available all seasons. The farm also provides small batch baked goods, spice mixes, and goats milk products. An online store for personal small orders is coming soon! Drumlin Farm works to build healthy soil, and healthy soil depends on the vitality of surrounding ecosystems. They grow all produce using organic principles, build their soil health with green manures, rotate crops, and use only organic matter for fertilizer. They do not irrigate their crops, and they never use any chemical pesticides, herbicides, or fertilizers. Purchasing a CSA share at Drumlin Farm not only supports their farming program, but also Mass Audubon’s overall mission to protect Massachusetts’ biodiversity and ecosystems. At Long Hill, they pride themselves on their environmentally friendly and sustainable farming practices, providing access to healthy, affordable, freshly harvested, locally grown fruits and vegetables in their small-town community. Their acres of orchards and fields offer Pick-Your-Own (PYO) apples as well as their growing CSA program. Although Long Hill is not organic certified, they do follow the Northeast Organic Farmers Associations guides to environmentally sustainable practices. New Harmony Farm is one of the two Certified Organic CSAs on the North Shore. They are committed to evolving organic by regenerating habitats for bees, butterflies, and other wildlife as well as a fertility program focusing on building vital soil life through increasing biodiversity, minimal tillage and mineral, and compost applications. Regular organic nutritional sprays work with the soil and plant microbiology to build robust immune systems and flavorful, vibrant crops. These mineral rich, biological growing practices make more bio-nutrients available in their produce. Delicious heirloom tomatoes, crisp salad greens, tender tasty carrots, hearty golden potatoes…these are just a few of the many exciting vegetables that members will find in the Red Fire Farm CSA this season. They offer local organic vegetable farm shares, local fruit shares, pasture-raised egg shares, fresh mushroom shares, and local organic flower shares for pick up or delivery to various locations in Western Massachusetts and the Boston area. Shared Harvest CSA is a multiple farm winter CSA that connects local, small-scale farmers with people who wish to eat well while supporting local family farms. Their primary vegetable growers are Picadilly Farm and Riverland Farm, both of which are certified organic. Cider Hill Farm grows their apples, and Charley Baer provides their dried beans. Sienna Farms CSA is a family-farm in their 12th year of operation, cultivating 50 acres of protected farmland in Sudbury and Concord, MA. They grow more than 100 varieties of vegetables for their 500-member CSA community, their farm stores in the Boston Public Market and Boston’s South End, their stall at the Copley Square Farmers’ Market, and select restaurants and chefs. The coastal farms of Dartmouth and Rochester take advantage of a beautiful and unique growing climate that give joy to all who work and live here. They sell a wide range of products including vegetables, fruits, cut flowers, herbs, mushrooms, free-range eggs, and jams. They also participate in local farmers markets and offer a seasonal farm stand, local CSA program, corporate CSA program, and restaurant wholesale. Still Life Farm rests on the historical Hardwick Poor Farm. They are reinvigorating tired pasture land into fruitful orchards and vegetable fields. Still Life Farms specializes in winter vegetable crops and feature a five-month winter CSA. Their budding fruit business includes a huge array of specialty fruits ranging from heirloom apples and sweet cherries to currants and gooseberries. Waltham Fields Community Farm (WFCF) is a 501C3 non-profit organization which promotes local agriculture and food access through their farming operations and educational programs, using practices that are socially, ecologically, and economically sustainable. They encourage healthy relationships between people, their food supply, and the land from which it grows. They offer a 20-week summer CSA share program. This is an easy, weekly, no-money-down, stock-up program. Beans & Greens Farm emails a CSA product list weekly and members place orders and then pick it up at the farm! There is no minimum commitment and everyone has access to fresh farm food! Tracie's Community Farm is a three-season CSA farm that provides high quality, nutritionally dense produce for CSA members and Farm Store. They offer door-to-door delivery as well as pick up on the farm. The Farm Store is open sunrise to sunset 7-days/week and operates by the honor system. Pricing: Shares are broken up into four sizes, all receiving the same variety of produce, but with differing amounts: Half ($285), Small ($380), Family ($560), and Large Family ($720) shares. Prices are for 16-week summer shares, including delivery! 9 Miles East Farm makes it easy for busy people to enjoy healthy local food. The farm delivers GO Bags of freshly harvested vegetables, as well as healthy prepared meals that make great lunches or dinners. There's no subscription, commitment, or prepayment, making the service a great fit for today's busy professionals. Eight Mile Creek is a certified organic, award-winning family farm. Choose from traditional, vegan, vegetarian, or paleo food combination options! All food comes from their farm and is humanely and lovingly raised. They offer seasonal or year round CSA options delivered to areas around the capital region and Westchester County as well as home delivery to your doorstep. Pamela Schreiber, the owner, holds a nutrition degree and writes a weekly blog with recipes, nutrition information, and photos from the farm. Essex Farm is a sustainable, diversified farm in the Champlain Valley of the Adirondack Park. They produce grass-fed beef, pastured pork, chicken, eggs, fifty different kinds of vegetables, milk, grains and flour, fruit, herbs, maple syrup, and soap. Their animals are fed certified organic food and they do not use any conventional pesticides, herbicides, or fertilizers. Their farm is horse and solar powered. They offer a full-diet, free-choice, year-round CSA membership. Each week they send members a list of the foods available on the farm and members pick what and how much they want Essex Farm to deliver straight to their door. Pricing: Varies per region. Members join as households, not individuals, so prices are based on number of adults and children in each household. Please visit essexfarmcsa.com for a more detailed description. Members commit until the end of the calendar year and new members are welcomed at any point in the year as long as there’s availability. Payment plans are available. Laughing Earth’s FarmShare is centered around members feeling like this is their farm. All members come to the farm each week to pick up their vegetables and enjoy the Picking Garden, where they can wander and harvest herbs, flowers, and more. Members are encouraged to join the farm for a once-a-month potluck and frequent educational events, from cooking demonstrations to nature walks. Pricing: $565 for 22-week share. They also offer a Community Food Program, where members who feel they can pay a little more for their share and members who feel the share is too expensive, request whatever amount they need from the Program, no questions asked. Letterbox Farm is the combined effort of an invested team. They raise super special vegetables, greens, herbs, eggs, and meat in New York's beautiful Hudson Valley. Pricing: Total retail value of each box ranges from $60 to $70, and members save 10% to 25% off retail. The Pfeiffer Center CSA offers 23 weekly pickups of freshly harvested, bio-dynamically raised vegetables, herbs, and flowers from June to November. pick up is conveniently located on the Threefold Educational Center campus in Chestnut Ridge, NY, from 3:30 to 6:00pm. At the market-style CSA, shareholders pack their own boxes, choosing from a generous selection from the harvest of the day; a gardener is always on hand to assist and answer questions. Phillies Bridge Farm Project is a not-for-profit farm on six acres, using organic and sustainable growing methods. They have a Food Justice mission, subsidizing CSA share to families in need and donating harvest to organizations that help food-insecure families.The Farm Project also offers educational programs, apprenticeships, and research. In addition to the CSA, they have a U-pick field for their members. Pricing: Season shares are $475 and $750 for 24-week small and large shares, respectively. Fourteen-week summer shares are $290 (small) and $450 (large), and the 10-week fall shares are $210 (small) and $325 (large). Rock Steady Farm is a women- and queer-owned cooperative farm rooted in social justice and growing specialty cut flowers and sustainable vegetables in Millerton, NY. They believe in utilizing holistic and sustainable farming practices that allow them to grow high quality vegetables, flowers, and herbs for the community. As a for-profit farm business and worker-owned cooperative, they strive to provide living wages for themselves and their employees. Rock Steady Farm believes that all people have the right to healthy and nutritious food. Pricing: Sliding scale share - $450 for 18-week full vegetables shares, $126 for 7-week dahlia flower shares, $108 for 18-week full egg share, $54 for 9-week half egg share, $162 for 18-week full fruit share, and $81 for 9-week half fruit share. Installment plans are available. They also offer corporate discounts and creative partnerships with non-profit and community organizations whose missions align with their values! Sang Lee Farms brings organic vegetables to parts of Long Island and Brooklyn where fresh organic produce is difficult to find. They grow more than 100 varieties of specialty vegetables, heirloom tomatoes, baby greens, and herbs. Their specialty are Asian produce, as they cultivate many varieties of Chinese cabbages, greens, and radishes. Delivery: Brooklyn (Crown Heights, Dumbo, Brooklyn Heights), Queens (Flushing, Far Rockaway), Long Island (Merrick, Sayville, Smithtown, Northport, Westhampton Beach, Easthampton). Pick up at farm also available. Little River Farm is a Certified Organic, 3-acre farm in Exeter, RI. They specialize in baby greens and microgreens, but also grow most vegetables that you would think of. Little River Farm grows year-round and offers a 10-month CSA. The farm is run by young farmers who believe in bringing the highest quality food to your table while also taking care of the land. Moonrose Farm offers chemical free, sustainably grown produce to 70 CSA members. Vegetables in the share will vary depending on the season's bounty, but the goal is to include salad, cooking greens, and herbs each week in spring and fall plus a variety of other veggies like radishes, peas, onions, carrots, beets, and more. Summer will include zucchini, tomatoes, cucumbers, peppers, eggplant, and other summer treats. Members are allowed to customize their share to include weekly additions such as fresh flower bouquets, mushrooms, herbal tea, and more.